SoarPay Is The #1 Merchant Account For Travel Businesses & The Timeshare Industry. SoarPay Is The #1 Choice For Timeshare And Travel Merchant Services. Many credit card processors do not accept travel and timeshare businesses for four reasons: (1) The first, is that travel and timeshare businesses tend to sell high ticket items. That is, their average product or service is often over $100.00 and in some cases well into the thousands of dollars. That’s important, because large transactions are charged back more frequently, and the risk to the credit card processor is higher because of the size of those potential chargebacks. (2) The second reason, is that the nature of the goods or services that are provided by travel or timeshare related businesses are prone to chargebacks. Customers often have a change of plans, whether its about their upcoming vacation purchase or their timeshare purchase or resale listing. Contrast that, for example, with a restaurant, which rarely encounters chargebacks due to a “change of heart”. (3) Some merchant services providers consider travel and timeshare businesses to be high risk because many businesses in this industry accept payment well prior to providing a service. For example, a vacation package provider might accept payment a full year before the vacation takes place. This business model, inherently, is vulnerable to increased chargeback rates. (4) And finally, travel and timeshare businesses often rely on third parties for service fulfillment. For example, a travel provider is relying on an airline to fly the customer, or a timeshare broker is relying on the timeshare owner to fulfill their end of the transaction. In either case, the introduction of third parties into the transaction create increased opportunities for customer dissatisfaction and potentially larger chargeback exposure. As a result of these four risks, many merchant account providers decline to accept travel and timeshare related businesses. Soar Payments, by contrast, has consistently served the travel and timeshares industries since its founding. Our extensive relationships with credit card processors and their sponsor banks who have the capability to underwrite businesses with increased chargeback risk exposure, in addition to our integrated chargeback and friendly fraud prevention software, make Soar Payments uniquely positioned to provide timeshare and travel merchants with stable, effective, and affordable credit card processing solutions. Shopping carts like Shopify, WooCommerce, BigCommerce, Magento, and CRM suits such as Zoho CRM and Salesforce. Soar Payments merchant accounts can also be integrated with most other eCommerce and POS platforms that are compatible with either Authorize.net, NMI, or USAePay payment gateways. A retail merchant account for timeshare or travel enables businesses to accept in-person credit card payments via a traditional credit card terminal or point of sale system. Best suited to retail businesses with reliable wired internet access, retail travel and timeshare merchant accounts typically have the lowest chargeback risk and receive the lowest merchant account pricing. A mobile merchant account for timeshare or travel, enables businesses to accept payments via a swiper that plugs into a mobile phone or iPad. Ideal for tour providers or other travel or timeshare businesses that conduct in-person sales outside of a traditional storefront, these merchant accounts have lower chargeback risk, and are priced as retail. Also called a payment gateway merchant account, companies can accept payments over the phone, via mail, or typed into a computer (without outside equipment). Our timeshare and travel payment gateway merchant accounts integrate with most major CRM and software platforms. Due to increased fraud risk, Soar Payments offers integrated chargeback protection with these merchant accounts. eCommerce timeshare and travel merchant accounts allow your company to accept debit and credit cards via your website’s checkout page. Our eCommerce credit card processing accounts integrate with most major CMS and shopping carts, making setup simple. Due to increased fraud and chargeback risks, however, we offer integrated chargeback protection software. What types of travel and timeshare businesses do you accept? Soar Payments accepts a wide range of US-based, US-operating travel and timeshare businesses. These include, but are not limited to, travel package sellers, excursion companies, hotel and lodging companies, airlines, timeshare issuers, and timeshare brokers and listing companies. It is important to remember that each merchant account is individually underwritten and approved, therefore your companies timeshare or travel merchant account approval may have unique terms. 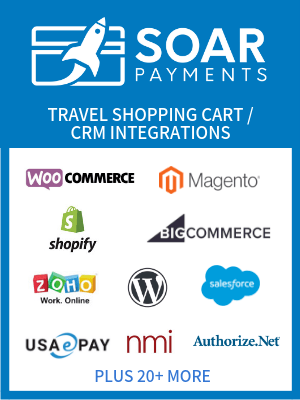 Is Soar Payments compatible with my existing CRM or shopping cart software? Established travel or timeshare businesses typically have a preferred eCommerce, shopping cart or CRM software platform they use. Because Soar Payments works with most major payment gateways (including Authorize.net, USAePay and NMI), our travel merchant accounts integrate with most popular software suites used by businesses in the industry. These include shopping cart platforms like Shopify, WooCommerce, BigCommerce, and Magento, as well as CRM suites like Zoho CRM and Salesforce. What criteria does my travel or timeshare business need to meet, to be approved for a merchant account by Soar Payments? To be approved, travel and timeshare businesses must meet the the following criteria: must have an ARC bond if selling airfare; must not make outbound calls to obtain customers (inbound marketing only); must be able to supply reseller agreements. ved for a merchant account by Soar Payments?